Ask fellow campers about "Lake Cove Resort" and nearby attractions. Stayed here for 9 nights because it was close to family. This park has good bones but needs a lot of love and updating. Everything in previous review is true but they do have a laundry room now. No one is ever in the office. You have to call the number on the door and wait for someone to show up. Water pressure is terrible. Residents drive too fast and kick up dust with no regard for people sitting outside. Probably wouldn't stay here again. 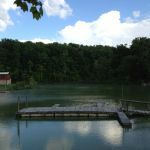 We camped at Lake Cove Resort in a Travel Trailer. Had to park the truck in the next site as there wasn't enough room in ours. RPI rate for this park. RPI can't know what this park actually is. Entrance off Oak Grove Rd is steep down hill. Sites are on the hill side, very narrow and not level. Sites are not designed for larger RVs and NARROW. With slides open you hang over the next slab. If you don't line up the wheels of the RV on the edge of the slab you are over the edge of the site & downhill. Hookups are at the far back of the site. I used up the whole length of the space with the 34' fifth wheel & no place to park the pickup. Additional hose length is needed to reach the pedestal. 30 amp only & no circuit breakers. Mostly long term residents and poor attitudes, barking dogs and late night parties. Temporary or short term sites are poor and the interior roads are dirt/gravel and very narrow. The pool is locked. The lake is very low, no access. The fishing pond is sludge & scum. No laundry. This is not a typical RPI resort, definitely not PREFERRED. We would NOT return to this poor excuse of a campground. We camped at Lake Cove Resort in a Fifth Wheel. Are you affiliated with Lake Cove Resort ?